From: Sharilyn Whitaker [mailto:sharilyn at northcoast. com) Sent: March 2, Dear Sandi, I don't want to overload you here with my problems, but I spent considerable time last year proving to my own satisfaction at least that Mary Snyder, Wife of Alexander Laughlen was a daughter of Simon Snyder and Mary Lane of Rumbout Precinct in Dutchess, where Alexander and Mary were married and had their first children. If you are interested in my reasoning, which involves the gap in Poughkeepsie records during the time of her birth, and also the identity of Marcus Snyder U. E. L., whom I believe to have been her brother, also born to Simon and Mary in that Poughkeepsie Roman Catholic black hole. The Peters connection to the two lines supports my view in my opinion. So, I have something to offer you I return for your assistance. Watchman, and the petition were granted. We have toyed with several ideas, a brief first marriage (how could she then have been a spinster at marriage?, adoption, but the option of her having been a step-child of Marcus Snyder, U. E. L., possibly Mary Snyder Mc Laughlen's brother, seems the most viable idea. Her mother's name might have been Elizabeth, which was the name of Marcus Snyder, U. E. L.'s Wife, and mother of his three known daughters. Now, one of our group recently discovered a Marriage Certificate for the son of Dorcas Watchman and Joseph Peters, and for his mother's name he gives DORCAS WATCHMAN (not Snyder), and she also found an 1824 record where a man named Osborn WATCHMAN witnessed a marriage in Elizabethtown. It is almost certain, considering the dirth of those of the Watchman surname, which Osborn Watchman was related to our Dorcas Watchman, possibly he was her brother, and this fits with other things we know, which I'll spare you. Eli Peters (brother of the Joseph Peters who married Dorcas Watchman and his Wife Phoebe Babcock have a son Eli Peters born 1824 that married Maria Elizabeth Mc Laughlen, daughter of Jacob, son of Alexander, and his Wife Ruth Johnson Johnston. Eli Peters and Maria Elizabeth have Thomas W. Peters b. ca 1851, who married Hannah Mc Laughlen. Hannah, b. ca 1851 in Wilton, Lennox Addington, Ontario, Canada, first Wife of Thomas W. Peters, was the daughter of JOHN Laughlen and Rosie Ann OSBORNE born about 1838. Hannah had a sister Hester who married Ben Mc Donald and died in childbirth with her first baby. 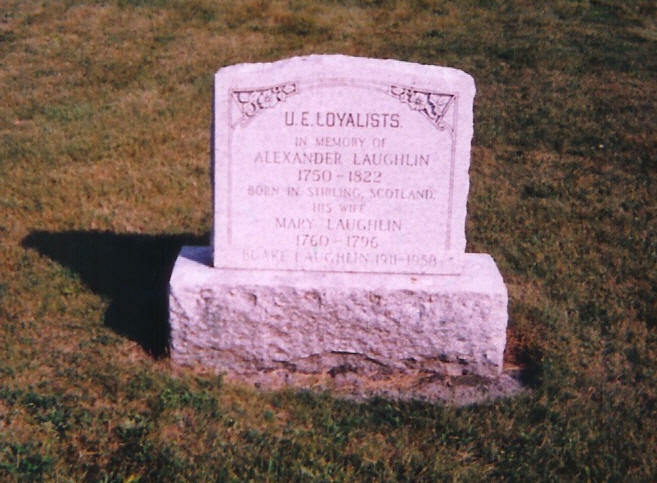 John Laughlen, born about 1814, was the son of Jacob Laughlen and his First. Wife Almira, after whom he and second Wife Ruth Johnson named a daughter. This makes John and Maria Elizabeth half-siblings. Hannah Mc Laughlen and Thomas W. Peters named their first son ISRAEL. OK now. Taking that name, adding it to Osborne, the maiden name of Hannah, I came up with a proposed "ISRAEL OSBORNE", whom I theorized might have been her Father. I then went to the list of captured Loyalists taken out of state, from "New York, USA in the Revolution as Colony and State, and there found Israel Osborne, I, Israel, II and Alexander, and also, of course, Alexander Mc Laughlen. Before we do anything else, are there mistakes in any of the above scenario that you are able to correct, and most important, can you clarify whether Jacob had TWO Marriages, the first to Almira producing John, and the second to Ruth Johnson Johnston producing Maria Elizabeth. I found the two marriages in another source; you have only the one to Ruth. The name Almira among his daughters by Ruth seems to offer a clue, but I have never seen the Mc Laughlen genealogy used as a source by most researchers of this family. This takes me to another question; can you help me access a copy of this Mc Laughlen genealogy? Among the very few things we have been able to come up with about the surname WATCHMAN, is that it is Scotch. We have developing links now between the families of Osborne, Watchman, Peters, Snyder and Mc Laughlen in Saratoga, during the period of capture of Alexander Mc Laughlen and Israel Osborne, and then in Ernestown, Lennox, Ontario, Canada. Studying the Mc Laughlen source material seems to be imperative to our research at this point. [S621] US, Dutch Reformed Church Records in Selected States, (Location: https://www.rca.org/rca-basics/archives;), Holland Society of New York; New York, New York; Poughkeepsie and The Flats, Book 39.